Large corporations often have significant marketing and advertising budgets that allow them to come up with innovative campaigns. Although you may not have the same budget available, these campaigns can still be a great source of inspiration. Often you can implement similar ideas at a smaller scale for a fraction of the cost. On that note, let’s take a look at McDonald’s latest DOOH campaign called Happy Meal Digital Play, which deployed gesture-controlled digital signage technology as part of a new Happy Meal marketing stunt. 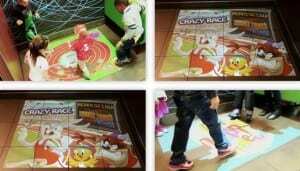 McDonald’s Happy Meal Digital Play concept is aimed at children and uses interactive, gesture-controlled technology to create a playful experience for kids. The set-up uses overhead cameras and infrared emitters that project onto the floor of the restaurant and respond to the children’s movements. This then forms the basis of an interactive game that links into the restaurant’s digital signage screens and uses popular characters, like Bugs Bunny and Tweety Bird. The technology has been implemented in a select few stores that have particularly high traffic from families. “The restaurant re-imaging program, and the testing of new design and technology innovations, is all about creating an eating-out experience that is fun, entertaining and a treat for every member,” a McDonald’s spokesperson said. Initial results have been promising. 92% of 5-9 year olds said they enjoyed playing on the interactive floor media and 87% said they wanted to visit that McDonald’s more often. Movement-controlled floor screens and digital signage software solutions are growing in popularity and have also been used in places like museums, where they can add an extra dimension to the educational experience. For businesses like McDonald’s, turning a marketing campaign into an interactive game and an opportunity for play is the perfect way to engage a younger audience.